In the mid 1980s, the British Antarctic Survey team discovered a hole in the ozone layer. The depletion had started in the 1970s. There were reports of ozone hole over the North Pole as well. The hole meant we were exposed to harmful UV rays with severe health impacts such as malignant and non-malignant skin cancers. Given that the Caucasian population was more vulnerable to the effects of UV radiation, ozone layer depletion assumed priority for Northern countries. In 1987, a multilateral agreement, Montreal Protocol on Substances that Deplete the Ozone Layer, was drawn. They agreed that the North would take action to stop the cause of ozone depletion, and the South would follow suit. The South would be given some leeway to take action and provided with financial and technological support to do so. The US agreed to fund it on the condition that the Montreal Protocol would not be used as precedent for future environmental negotiations. 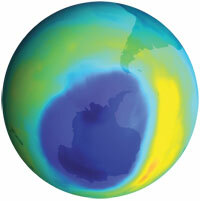 The cause of the hole in the ozone layer was a chemical called chlorofluorocarbon (CFC). Used mainly in aerosol propellants, refrigeration, air-conditioning, plastic foams and solvents for cleaning electrical components, the chlorine in CFC was found to deplete the ozone layer. Countries decided to shift to a partially halogenated CFC, called hydrochlorofluorocarbon (HCFC), which was a patented product. This also damages the ozone layer, though less than CFC, and was an interim solution. Industrialised countries phased out CFC in 2000 and now have to phase out HCFC by 2020. The alternative of HCFC is an expensive and patented product—non-chlorinated HFCs. The plan is that developing countries would begin HCFC phase-out from 2013, and finish it by 2030. But the question is, what do developing countries phase in to. There is a virtual war over the chemicals and their alternatives, both because of commercial interests and because each chemical has its good and bad parts. A chemical may not be an ozone-depleting substance (non-ODS), but may have high global warming potential (GWP) and cause climate change. HFCs pose no harm to the ozone layer because, unlike CFCs and HCFCs, they do not contain chlorine that depletes the ozone layer. But HFCs are super-greenhouse gases with an extremely high GWP. This means they can trap enormous amounts of infrared radiations in the atmosphere and can cause greenhouse effect a thousand times stronger than CO2. The industrialised world has already shifted to HFCs and is merrily contributing to greenhouse gases with use of this chemical in air-conditioners and refrigerators. All eyes are now on developing countries. Will they also choose HFCs and add to the gases in the atmosphere that take the world closer to the catastrophic climate change? Sugarcoated knives are out as the rich convince the poor not to take their route but leapfrog to cleaner substances. What they do not say is that the alternatives are still experimental, contested, expensive and in the hands of their companies. They want the poor to jump into the costly, unknown world of patented technologies in the common interest of all. The poor and their companies are also seemingly greedy. They want double gains: get paid to move to substances that win the ozone fight and then get paid to shift away from these chemicals to those that save the world from climate change. On the face of it, the Montreal Protocol reads like a conscientious effort of the world joining hands to avoid a catastrophe of unprecedented proportions. Look deeper and a grim tale of corporate manipulations emerges. Some of the largest chemical companies administered a nostrum that only compounded the problem. Phasing out of chlorofluorocarbons (CFCS) was more or less dictated by companies that made the gas. Initially, the companies opposed the switch. In the 1980s, DuPont, synthesiser of polymers such as nylon, teflon and lycra, produced close to 25 per cent of global CFCs. US and European companies together produced 79 per cent of all CFCs. Led by DuPont, many chemical manufacturers coalesced under Alliance for Responsible CFC Policy to oppose any move to discontinue this refrigerant. Imperial Chemical Industries (ICI), a British firm, also lobbied with its government against any change. But in 1988, DuPont did a U-turn. They had found a substitute and pressed for a change anticipating the Montreal Protocol would mandate its technology for the global transition and create a lucrative market. Robert Falkner, associate professor, International Relations, London School of Economics, in his 2005 paper titled ‘Business of Ozone Layer Protection’, points out, “Beneath the surface of industry cooperation a fierce commercial battle for the substitutes market unfolded. In contrast to the smaller CFC producers, large chemical firms such as DuPont and ICI were already in a leading position to sell alternative products”. There were two alternatives to the big refrigerant and air-conditioner market—hydrochlorofluorocarbons (HCFCs), a cheaper transition option and its counterpart hydrofluorocarbons (HFCs). HFC was known to be a potent greenhouse gas but was favoured because as companies held patent for HFC-134a, used for air-conditioning, and asked for prohibitive rates for technology transfer. The Montreal Protocol fund did not agree to pay for royalty and patent cost. Given this, developing countries bunny-hopped to the next best option, HCFC. HCFC is an ozone-depleting substance and has high global warming potential (GWP). This is when the third alternative came in. A German firm developed a refrigerator coolant using a mixture of propane and butane. These hydrocarbon-based technologies were cheaper and not in control of any company, so no one showed interest. In fact, the US went a step ahead and banned use of hydrocarbons saying they were inflammable and unsafe. The Montreal Protocol bans trade in ozone-depleting substances between nations that are not party to the agreement. The developing world had to phase out CFCs by 2010. Industrialised countries agreed to pay for incremental transition costs, including transfer of technology and replacement of equipment for transition through a multilateral fund. The World Bank and United Nations agencies were made the implementing agency for the project. India got a share of the fund as well. Four companies shared the $82 million (Rs 410 crore) grant, which included Chennai-based Chemplast Sanmar Ltd, Gujarat-based Gujarat Fluorochemicals Ltd, Navin Fluorine International Ltd (formerly Mafatlal Industries), and Rajasthan-based Shri Ram Fibres Ltd. In 1998, the four companies accounted for 16 per cent of the world production of CFCs, only behind China’s 35 per cent share. The funds paid for their transition to HCFC, at best the interim solution. Doing all this, India phased out production and consumption of CFCs by 2008. 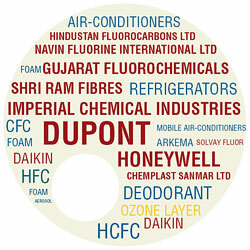 The new gas, paid for by the Montreal Protocol, opened a bonanza for Indian and Chinese HCFC manufacturers. It produced a byproduct which was dangerous for climate change and manufacturers got paid so much that they could book profits many times more than what they made by selling the refrigerant. How? HCFC-22 is a variant of HCFC, used in the majority of the air-conditioners and refrigerators in India. Producing it releases HFC-23, which is 11,700 times more powerful than CO2 as a greenhouse gas. Given HFC-23’s GWP, companies needed to be paid to destroy the gas so that it was not released in the atmosphere. They could apply for credits under Kyoto Protocol’s Clean Development Mechanism (CDM). For every tonne of HFC-23 destroyed, companies would earn 11,700 Certified Emission Reductions (CERs), which were selling at roughly €12-15 (Rs700-1,000) per unit. For every tonne of HCFC-22 produced, 30 kg of HFC-23 is generated. It was profitable to make more HCFC-22 so they could burn more and earn more. It started a gold rush. Erstwhile CFC and now HCFC-22 manufacturing companies rushed to get registered under CDM. Of the 19 such HFC-23 destruction projects eligible to get carbon credits, 11 are in China, five in India (see table), and one each in Argentina, Mexico and the Republic of Korea. China makes 92 per cent of HCFC-22 among developing countries and, therefore, has made the most from HFC-23 destruction. HFC-23 is destroyed by incineration and costs pittance. But companies earned 50-100 times more money by selling CERs than the cost of destroying the byproduct. Incinerating a tonne of CO2-equivalent of HFC-23 costs €0.17 (Rs 11). But the money earned by selling CERs is € 12 (Rs 780), which is 70 times more than the cost of destroying the gas. 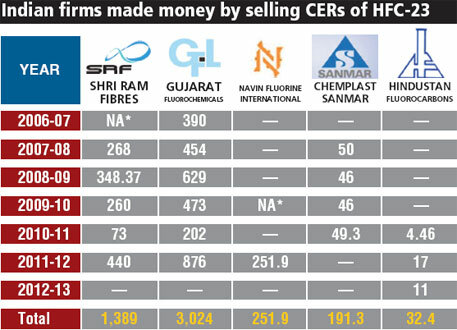 Profit made by these companies selling HFC-23 CERs was much more than selling HCFC-22. For example, Shri Ram Fibres’ annual report shows in 2008-09 the company made profits worth €53.59 million (Rs 348.37 crore) from CERs, which was more than twice the profits from its fluorochemicals products. The easy money from CERs has not gone unnoticed and elicited criticism from global environmental groups. In 2010, Washington-London based Environmental Investigation Agency (EIA) alleged that Indian and Chinese HCFC-22 manufacturers have a perverse incentive to produce more HFC-23 for every tonne of HCFC manufactured. They argue that as the proportion of the byproduct released is dependent on the manufacturing process, companies can change the process to get more HFC-23. The CDM board uses historical data from an HCFC manufacturing plant to determine the percentage of HFC-23 to be produced from every tonne of HCFC-22. In a well-operated plant this can be as low as 1.4 per cent. However, companies have consistently showed HFC percentage to be above 3 per cent by reconfiguring the process. Following the controversy, in 2011 the European Union banned CERs for HFC-23 from 2013. The primary market for HFC-23 CERs is non-existent. However, companies are still producing HCFC-22. The question is what are companies doing with the harmful byproduct. Their options include storage, which would allow for payments later, or incineration, or release it and add to the stock of greenhouse gases in the atmosphere. Sukumar Devotta, former director of National Environmental Engineering Research Institute, Nagpur, speculates that companies would choose to release the byproduct as storage costs money and they are no longer paid for incineration. “There is also no legal rule against venting HFC-23, so they are free to do so,” Devotta told Down To Earth. EIA, which published results of its sting operation of HCFC manufacturers in India and China in its 2013 report, Two Billion Tonne Climate Bomb, confirms that without an incentive Indian companies are likely to vent the gases. “My sense is that we will probably stop (the incineration) internally because there is cost in incinerating, and unless there is revenue to at least compensate that cost it wouldn’t make sense to keep on incinerating,” EIA quotes a senior official of Gujarat Fluorochemicals Ltd in their report. Down to Earth sent questionnaires to the five incinerating companies and followed it with phone calls, but the queries were mostly unanswered. Shri Ram Fibres, which produces 11,000 tonnes of fluorochemicals responded, “Under CDM, our project for incineration of HFC-23 remains in operation.” It also said it was investing in HFC-134a, with plans to ramp up production to 17,500 tonnes by 2014. When contacted, state pollution control boards pleaded ignorance and lack of capability to regulate the release or storage of the gas. Profits part III: transition to what? Nobody really knows what is happening to the byproduct HFC-23. But the good news is that companies say they are moving from HCFC-22 to something else. The politics is what will they move to: single or double-jeopardy gas? Starting in January 2013, production of HCFCs in India has to be frozen at the 2009-10 level, about 160.8 ozone depleting potential (ODP) tonnes. Subsequently, as per Indian government’s HCFC phase-out management plan of February 2013, consumption would decrease by 10 per cent by 2015 and stopped by 2030. The Indian government is now expecting funds from the Montreal Protocol for the phase-out. But with the alternatives disputed as they have global warming potential, negotiations have come back a full cycle. 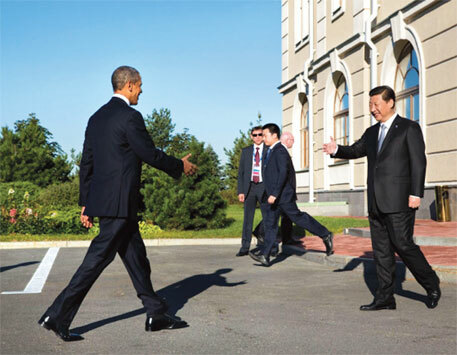 On September 6, 2013, at the G20 Summit in St Petersburg in Russia, US President Barack Obama and Chinese President Xi Jinping reiterated the deal they had struck on hydrofluorocarbons (HFCs) in June in the US. Under the deal, the two countries would use the Montreal Protocol to phase down HFCs, while the accounting and reporting of HFCs emissions would continue to be under the United Nations Framework Convention on Climate Change (UNFCCC). The other G20 leaders are said to have concurred. This is a big victory for the US, as India and China had been against discussing HFCs phase-out under the Montreal Protocol for the last four years. So why is the US so interested in HFC when it has been a regular spoilsport in global climate negotiations and has failed to take any meaningful action on climate change domestically? HFCs are a part of pollutants called short-lived climate forcers (SLCFs), which warm the climate but have a relatively short lifetime in the atmosphere. Other major SLCFs include methane from oil and gas wells, rice cultivation and enteric fermentation in animals, black carbon (or soot) emitted from diesel vehicles and burning of biomass. Reducing emissions of SLCFs, which have a shorter lifetime than CO2 will show rapid results. CO2 remains in the atmosphere for more than a century. United Nations Environment Programme and World Meteorological Organization have projected that reducing SLCFs, especially methane and black carbon, can slow down warming expected by 2050 by as much as 0.5°C. Regulating HFCs, they estimate, can prevent an additional 0.05°C to 0.1°C by 2050. The US civil society has convinced its government that fast action on SLCFs will give the world time to get an international climate deal. It will also give breathing space to the US, which in any global climate deal will have to take maximum emissions cuts. Most of the action to reduce SLCFs has to be taken in developing countries. Countries like India have not yet moved entirely to HFCs, so the urgency is to ensure that they do not shift to this substance. The US is not so vocal about its plans to fast-track reduction of HFCs in its domestic industry. But it wants to shift the agenda to Montreal Protocol, which it believes will get quick results. WHY TAKE UP ONLY HFCS? The fluorinated gas (F-gas) basket comprises HFCs, perfluorocarbons (PFCs), sulfur hexachloride (SF6) and nitrogen trifluoride (NF3). PFC is produced as a byproduct of various industrial processes associated with aluminum production and manufacturing of semiconductors. SF6 is used in magnesium processing and semiconductor manufacturing, and in electrical transmission equipment. Use of NF3 is booming for products from computer chips and flat-screen LCDs to thin-film solar photovoltaics. Emissions of SF6 and PFCs do not seem significant when compared to other greenhouse gases, but they have considerably long lifetimes in the atmosphere combined with high GWP. The US Environmental Protection Agency (USEPA) estimates the total SF6 emissions from production, use and disposal of electrical equipment at 27 million tonnes CO2 equivalent (MTCO2e) in 2000 growing to 66 MTCO2e in 2020, if no mitigation actions are taken. PFC emissions from semiconductor manufacturing were 30 MTCO2e in 2000. USEPA expects significant growth in this sector unless the World Semiconductor Council’s commitment to reduce PFC emissions by at least 10 per cent from 1995 levels is implemented and strengthened. NF3 has 17,200 times the warming potential of CO2 and is rapidly increasing in the atmosphere. According to a study published in the Proceedings of National Academy of Sciences, emissions of NF3 in 2010 accounted for between 17 per cent and 36 per cent of emissions of the most widely used and emitted fluorinated compounds from the semi-conductor industry, up from between 13 per cent and 28 per cent in 2005. The recent emissions of NF3 are almost entirely from production and end use in semi-conductor manufacturing and are larger than those of the other fluorinated compounds from semi-conductor manufacturing. Thus, if NF3 production rates follow demand for production of semi-conductor devices, emissions are likely to rise significantly in the near future. The question that arises is: why HFC alone should be picked up and tackled under the Montreal Protocol? In 2009, the US and Micronesia submitted proposals to amend the Montreal Protocol to include phase down and phase out of HFCs. They argued that Montreal Protocol should address HFCs because its use had increased due to the chlorofluorocarbons (CFCs) and hydrochlorofluorocarbons (HCFCs) phase-out pushed by the Protocol. Developing countries argued that HFC is not an ozone-depleting substance (ODS), rather, it is among the six greenhouse gases under Kyoto Protocol, so the climate convention, UNFCCC, should deal with it. They quote Article 4.1 of UNFCCC which states that all greenhouse gases other than those under the Montreal Protocol should be addressed by UNFCCC. The US and its allies counter this by quoting from Article 2.1 of the Vienna Convention for the Protection of the Ozone Layer, under which the Montreal Protocol is placed. It states that countries are obliged to take action to prevent any adverse impact of the activities taken to protect the ozone layer, thereby justifying Montreal Protocol as the right platform to tackle HFCs. Arguments of both sides have changed little since. Civil society in the US and the EU says the Montreal Protocol has the institutional capacity and the Multilateral Fund to pay for transition in developing countries. They also cite the track record of action under Montreal as evidence of a global agreement that can deliver fast results. But there are many unanswered questions about this US-led campaign for HFCs under the Montreal Protocol. What is the best technology for developing countries to move to? The new technologies are still untested. Who will pay for the transition if the costs are high? The Montreal Protocol is low on funds even to phase out HCFCs. Developing countries say they want more clarity before they agree to allow HFCs to be discussed under Montreal. What also goes against UNFCCC is that it is not designed for a phase down or phase out mechanism, and HFCs need to be urgently tackled owing to their growth potential in the developing economies. The counter argument is that HFCs are not the only fluorinated gas (F-gas) in the UNFCCC basket that need to be phased out. Choosing only HFCs does not address the problem F-gases are likely to cause in the future (see ‘Why take up only HFCs?’). It is clear why the rich country industry wants HFCs under the Montreal Protocol. Under UNFCCC, HFCs can only be addressed under a market mechanism like Clean Development Mechanism (CDM). This means that to earn more carbon credits, a country will move to least global warming potential (GWP) gases such as hydrocarbons than even relatively low GWP HFCs. Many refrigerants, for which these companies hold patents, will lose out. Montreal Protocol, on the other hand, is a regulatory process that gives flexibility to sell gases, and even those with a higher GWP may make it through the net. The agreement works to create a mandated market for certain alternative technologies, which are then paid for by the Multilateral Fund. The European Union is replacing its old regulation on fluorinated gas by early 2014. The new regulation has scope for all fluorinated gases—SF6, perflurocarbons (PFCs) and hydrofluorocarbons (HFCs). It has phase down targets for HFCs—to be reduced to 21 per cent of the baseline (2008-2011) by 2030. But there are areas of disagreement. The new regulation bans pre-charging of air-conditioning and refrigeration equipment. This would guarantee installation by only certified professionals allowed to take delivery of fluorinated gases. Some new F-gas equipment and products will not be allowed and high-GWP HFCs will not be allowed for servicing of equipment. The regulation also proposes the producer’s responsibility in ensuring that emissions do not occur. The country has a fluorocarbon recovery and destruction law of 2002. An amendment bill was passed recently, which is likely to come into place by 2015. The existing law covers only recovery and destruction of fluorocarbons. This has led to rapid consumption of HFCs, 80 per cent of which are in air-conditioners. The recovery rate is fairly low. The new amendment will have phase down schedules for HFCs and for reclaiming used gas. After a certain point, manufacturers and importers will be required to introduce new non-F-gas or low-GWP F-gas equipment. For refilling and recovery of F-gases, fillers and recovery operators will have to be registered with local government agencies and trained. F-gas recovered can be destroyed or recycled only by a government-approved agency. California is reducing HFCs in mobile air-conditioning systems through Low Emissions Vehicle regulation, which requires all passenger cars, light duty trucks and medium-duty passenger vehicles to use refrigerants with a global warming potential less than or equal to 150 starting 2017. In the US, the Significant New Alternatives Policy (SNAP) makes decisions on a particular substitute in a particular end use within a larger sector. Substitutes are reviewed on the basis of ozone depletion potential, global warming potential, toxicity, inflammability and exposure potential as described in the final SNAP rule. US non-profits argue that if alternatives exist, old technology should be banned. Through this, they should get rid of HFCs. But the fact is that the US has no target or regulations for reducing HFCs. The sellers have an interest in this system. It also has teeth—countries are banned from importing controlled substances from non-parties. So, it works for technology-sellers to get access to markets across the world. Also, today’s first movers, technology sellers with some products, can get advantage in this game. Developing country industry is no different. It is also looking for short-term motive and would prefer to keep negotiations under Montreal to phase out HCFCs, and under UNFCCC to phase out HFCs. They have tasted blood and see the advantages of getting payment under one convention and credits to phase out the same product under another convention. They want it all. How much will HFC really grow? The question how much greenhouse gas emission would the world avoid if it tackles HFC transition depends on projections of rapid growth of refrigerators and air-conditioners in the developing world using HFCs. The 2009 study done jointly by The Netherlands, US agencies and DuPont shows that by 2050 the total HFCs emissions will be 5.5-8.8 billion tonnes of CO2 equivalent per year. In business as usual scenario, this is equivalent to 7-19 per cent of CO2 emissions in 2050. However, there are studies that project much lower HFC emissions. A 2011 study by German agencies projects that by 2050 the total emissions of HFCs will not exceed 3.5 billion tonnes of CO2 equivalent per year. The difference is largely because nobody knows the growth rate and penetration of air-conditioners and refrigerators in the developing world. Also, it is assumed that there will be no technology development in developing countries to move out of HFCs. So, the US government’s emphasis on HFCs seems lopsided. HFC emissions currently account for less than 1 per cent of the total greenhouse gas emissions. Industrialised countries are responsible for this (see ‘HFC emissions on the rise’). In fact, it can be argued that improving the efficiency of air-conditioners and even reducing the numbers, through green building technologies, would bring much bigger benefits to climate change. Refrigerators and air- conditioners emit CO2 indirectly by using electricity largely produced from fossil fuels. In the entire life cycle of these products, one has to look at the contribution of direct emissions of HFCs vis-à-vis indirect emissions due to electricity use. A highly energy-inefficient equipment using a least GWP refrigerant will have more life cycle emissions than a highly energy-efficient equipment using high GWP refrigerant. It has been found in many life cycle climate performance assessments that the refrigerant comprises 5 per cent to 20 per cent in the life cycle greenhouse gas emissions of a product. Some industrialised countries are moving to enact legislation to phase out HFCs (see ‘Regulating F-gases’). The politics is now out in the open and developing countries need to make careful choices that will be best for industry and the planet. When CFC phase-out began, industrial refrigerator sector moved to environment-friendly alternatives such as CO2, ammonia and hydrocarbons. 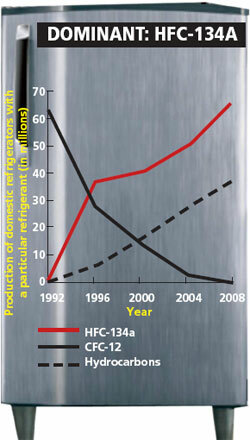 Home refrigerators globally first moved to HFC-134a, but then hydrocarbons caught on. At present, 36 per cent of the new domestic refrigerators and freezers use hydrocarbons. The proportion is expected to reach 75 per cent of global production by 2020. In parts of Asia, South America and Australasia, the most common hydrocarbon used in the production of refrigerators and freezers is HC-600a, or iso-butane. In Europe, almost all new refrigeration systems use iso-butane. The US, however, continues to use HFC-134a, which has a high global warming potential (GWP). It allowed use of hydrocarbon in refrigerators only in 2012. Hydrocarbons are used in about a quarter of the new installations such as cold storage, ice-skating rinks and large-scale freezing of food. Currently, the industry is developing refriger- ants such as CO2 in marine containers and trailers, and propane in trucks. Many supermarkets, and food and beverage producers are also volun tarily moving to green alternatives (see ‘Green claims’). Refrigerator is a growing market in the country, currently valued at Rs 10,000 crore, according to market research firm Netscribes. It is expected to grow at a compound annual growth rate of 11 per cent by 2014-2015. Godrej is on a par with Whirlpool, with 18 per cent market share in refrigerators, after LG and Samsung, which occupy the first two spots. Except Godrej, the others use HFC-134a in their refrigerators. Godrej commercialised its hydrocarbon refrigerators in 2002. In a tie-up with the Swiss Development Corporation, the company made iso-butane refrigerators. The company has sold 10 million such refrigerators, and has not reported any inflammability-related accident during the period. Birla Aircon experimented with the propane technology but did not market it for lack of support. “Our hydrocarbon water cooler is energy efficient and cost-effective because the quantity of gas required is only 100-150 grams,” says company head P K Jain. The company developed two models and brought about 150 pieces in the market, but the response was not overwhelming, largely because of lack of awareness. “If you hear that the product you are about to buy might blow up, you will never buy it. The inflammability hype around hydrocarbons needs to change,” he says. Safety concerns aside, barriers to the transition include insufficient technical knowhow in companies, lack of practical skills among technicians, insufficient supply of components and materials, inadequate access to proprietary technologies, the cost of generating data for regulatory approval procedures, and higher investment costs. And these barriers are not restricted to the refrigeration sector alone. Polyurethane (PU) foams, which lie hidden in refrigerators, freezers and upholstery inside metal and plastic walls, are also used for insulation. In India, PU foams have been used since 1960s. HCFC-141b is the predominant blowing agent in the sector. A blowing agent is used for its different properties, some create cushioning effect, while others reduce the product’s weight. Many developing countries, including India, intend to adopt low GWP alternatives to foam products as part of their HCFC phase-out plan. China and Brazil, for instance, intend to use methyl formate and hydrocarbons instead of high-GWP HFCs. India plans to switch to hydrocarbon cyclopentane in its first stage of HCFC phase-out management plan. The Montreal Protocol incentivises the transition to hydrocarbons by providing a 25 per cent bonus to countries that make this shift. Indians have secured US $23 million from the Multilateral Fund for this transition. HFCs dominate the air-conditioning sector, but there is the potential to leapfrog. Will the market allow this? We live in a world where the inconvenience of a hot summer day can be switched off by switching on an air-conditioner: a luxury that has become the norm. The world produces over 100 million air-conditioner units annually just for household use. The problem is what goes into the making of the air-conditioner and then in running it. When CFCs were phased out, this sector in the developing world moved to HCFC-22 as an interim replacement. The industrialised world made the switch to different substances. But this has taken the world from the frying pan to the fire. The US, Japan and the EU shifted to HFC-410a as the primary replacement and to HFC-407c in smaller quantities. However, HFC-410a has a global warming potential (GWP) of 2,088. This means a tonne of HFC-410a will cause 2,088 times more global warming than a tonne of CO2. A few companies voluntarily chose to move to hydrocarbon refrigerants such as HC-290, which is propane-based refrigerant and has advantages in terms of energy efficiency and climate change. But this was not encouraged and the reign of HFCs continued. It is only now that the EU is considering a fluorinated-gas regulation (see ‘Regulating F-gases’) that considers phasing out all HFCs and, therefore, paves the way for non-HFC alternatives such as hydrocarbons. The US is also following a two-step phase-out, purportedly to aid its industry. It allowed industry to shift to HCFC-22 and banned its use in new products only in 2010. In this way, it continued to use HCFC-22 even as some of its industry moved to HFC-410a. But it is China that makes the world’s air-conditioners and the irony is there to see. 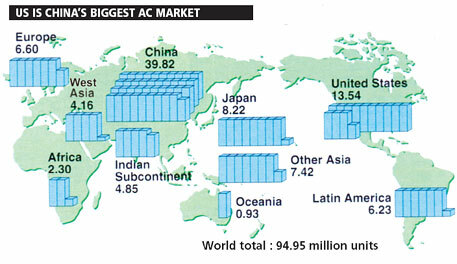 In 2011, China made nearly 70 per cent of the world’s air-conditioners and exported many. The US bought 85 per cent of its air-conditioners from China. The country uses cheaper HCFC-22 for its domestic consumers and the more expensive patented substance HFC-410a only for export. In early August, France banned import of German Mercedes cars, throwing the market in a tizzy. The reason was that Mercedes declined to switch to new, climate-friendly substance in its air-conditioners because it said it was inflammable. It went back to using HFC-134a, which had been banned by the EU. In 2007, the EU issued the Mobile Air-Conditioning (MAC) directive that required all new cars by 2017 to have air coolant with a GWP equal to or lower than 150. The law became effective from 2011. HFC-134a, which was the substitute for CFC has a high GWP of 1,430 and so the French were right. Compared to home and factory refrigerators, air-conditioners in cars’ cooling system seem somewhat trivial. But mobile air-conditioners account for 25 per cent of the total HFC consumption worldwide. Also, in a world that is crazy about its cars and wants them better and cheaper, everything about them is serious business. In 2012, DuPont and Honeywell produced HFC-1234yf, which became the preferred choice to replace HFC-134a. This new substance has a GWP of 4, which makes it climate-friendly. In the EU, the US and Japan more than 10 car models moved to this product. But then came the hitch: it is mildly inflammable. Initially this was a non-issue, but German manufacturer Daimler did real-life tests and found that when mixed with lubricants it proved inflammable in a hot engine compartment. Based on the new finding, Daimler concluded that HFC-1234yf should and will not be used in its products. Following this, the Society of Automotive Engineers (SAE), a US-based automobile association reviewed the findings and found such risk “exceptionally remote” and Daimler’s tests “unrealistic”. But the European car majors remain unconvinced by the US pitch. Now, four more German car manufacturers have said they will not use HFC-1234yf but will develop CO2 as an alternative refrigerant. Trade wars are on. India has both domestic players and multinationals on its roads. Most companies use HFC-134a and seem unsure what they will do next. They know that India does not need to take action in a rush. However, companies that export to Europe know they will be hit by the MAC directive and will not be able to use any substance with GWP more than 150. The last time the automobile world did a transition from CFCs to HFCs, the transition happened in less than five years. Car firms all over the world decided to phase-in HFC-134a to replace CFCs. Automobile manufacturers were said to be ahead of the curve, having jumped from CFC to HFC, bypassing HCFCs. The fact that HFC was a greenhouse gas was known but ignored. For now, it is the Germans (Daimler and the rest) against the US’s Honeywell and DuPont. The fight has only just started. Now it is known that the industrialised world’s transition to HFC-410a is a dud. It does not burn a hole in the ozone layer but adds to the warming of the climate. So the transition to a new substance is in the air. The technology politics follows companies and countries. The US is pushing for DuPont’s hydrofluoro-olefins (HFOs), which are a group of compounds that contain hydrogen, fluorine and carbon similar to HFCs, only they are derivatives of alkenes (olefins) and not alkanes. DuPont is promoting HFOs as the “fourth generation” refrigerant following in the (disastrous) footsteps of CFCs, HCFCs and HFCs. This is when so far only HFO1234yf has come into commercial use, and in the mobile (car) air-conditioning sector. But DuPont claims one of its products, L-41, is undergoing trials and will soon be ready for the highly lucrative air-conditioning market and will replace HFC-410a. In this way, once again, history will repeat itself. There will be a new substance, said to be benign and safe, which will be sanctioned by the Montreal Protocol and sold across the world as the alternative. No wonder, somebody is laughing all the way to the bank. Japan’s Daikin has chosen HFC-32, a medium-GWP HFC (it has global warming potential 675 times of CO2 as compared to HFC-410a which has GWP of 2,088). It says this substance will work best as it will be less damaging, both in terms of direct emissions and indirect emissions from energy use. A split system with HFC-32 achieves higher energy efficiency when compared to HFC-410a and so has better life cycle emissions. Japanese companies like Daikin and Panasonic are aggressively promoting the use of HFC-32 in the developing countries. They have relaxed patent conditions and offered free access to these countries for the use of this substance and are building facilities globally for its manufacture. India’s air-con game on for what? The question is: what should developing countries, which start their phase-out of HCFCs in 2013, do? There are three refrigerant options to replace HFC-134a in automobiles: HFO-1234yf, HFC-152a and CO2. HFO-1234yf is a “near drop-in” replacement, requiring minor equipment modifications and is almost as efficient as HFC-134a. However, manufactured and patented by DuPont and Honeywell, it is the most expensive of all the options and costs more than five times the gas currently in use. There are concerns about its flammability. In addition, there are concerns about negative environmental impacts from HFO-1234yf as its breakdown compound trifluoroacetic acid can contaminate water. CO2 is less expensive but requires change in the set of components used in manufacturing of vehicles and can add to the expense. It is yet to become commercially viable and is being developed by German firms. HFC-152a is less expensive than HFC-134a. But vehicles designed for it have to carry the additional expense of a secondary cooling loop to keep the inflammable refrigerant from entering the passenger’s compartment. In India, by and large, top manufacturers of air-conditioners like Voltas, LG and Samsung, use HCFC-22 and plan to shift to HFC-410a. Voltas representatives, however, told Down To Earth that they are considering other options as well. The use of HFC-410a, which increases the cost of the product by 15 per cent in the cost-sensitive Indian market, is one driver for this change of course. Voltas is currently carrying out trials with gases, which can be both economical and have a lower global warming potential. They are looking at HC-290, a hydrocarbon that has concerns of inflammability, and also testing air-conditioners using DuPont’s HFO. Other multinational companies that operate in India such as Panasonic, Hitachi, Daikin and Carrier follow the decisions of their parent companies. In India, Daikin is building a facility in India to manufacture HFC-32 and Carrier is expected to do what its US major does. This is when there are options, which do not destroy the ozone layer or add to the threat of climate change, that can be considered. Way back in 2000, the Montreal Protocol’s Technical and Economic Assessment Panel had advocated the use of natural refrigerants, hydrocarbons used in 1920s, before replacement by CFCs, as the best alternative. But in the commercial world of Montreal Protocol phase-out, these options were discarded. Now once again, there is a revival of interest. Working with China, GIZ, the technical supporting arm of the German government, has helped convert a production line, one of the world’s largest to hydrocarbon split air- conditioners. The substance used is propane. These units are also better on energy usage. Roughly 1.5-2 tonne air-conditioner, which uses 330 grams of the chemical substance, would achieve between 10 per cent and 15 per cent higher energy efficiency than the existing models. In this one production line of 180,000 air-conditioners annually, replacement to hydrocarbon will prevent 560,000 tonnes CO2 equivalent of direct emissions during the lifetime of the units. Additionally, indirect emission of 320,000 tonnes CO2 equivalent will be avoided through improved energy efficiency of the units. But the fight for dominance is on. The fear is that technologies will out-compete not because they provide the best option for the world in terms of both ozone layer and climate change but because they have the might of their government behind them. So, the Japanese are pushing for HFC-32, Americans see lot of potential in HFOs and the Germans have put their muscle behind hydrocarbons. Developing countries are the target. The route the world decides to use to phase-out HFCs will determine who wins. For the followers of global negotiations on environmental issues, the predicament we are in with respect to hydrofluorocarbons (HFCs) is not new. The issue is marred by the huge trust deficit between industrialised and developing countries. There are legitimate reasons for this distrust. Most environmental negotiations are economic negotiations, but in Montreal Protocol it has taken a whole new dimension. The protocol has definitely played a critical role in reducing ozone-depleting substances. But it is also a fact that interests of a handful of companies have shaped the contours of this protocol. The US-led effort to bring HFC phase-out to Montreal Protocol, without referring it to UNFCCC is shortsighted. It does not recognise that HFCs are currently covered under UNFCCC and not Montreal Protocol. While these two conventions have previously discussed the issue of HFCs, there is no formal decision to allow for Montreal Protocol to take over. When aviation and maritime-related emissions were moved to the International Civil Aviation Organisation and International Maritime Organisation all UNFCCC parties had agreed to it. Moving HFCs to the Montreal Protocol will have to be agreed to by all parties under UNFCCC. This will give confidence to developing countries that the principles of common but differentiated responsibility are secured. HFCs are part of the larger family of fluorinated gases that cause global warming. F-gases include HFCs, perfluorocarbons, sulfur hexafluoride and nitrogen trifluoride (NF3). They all are potent greenhouse gases, many of them used as replacements for ozone-depleting substances. NF3 has GWP of 17,200. It is used to make microelectronics, including solar photovoltaic cells, and is expected to grow significantly. An approach that addresses only HFCs and overlooks the other super greenhouse gases is a piecemeal solution and, therefore, the question is: whether Montreal Protocol will address all F-gases and how? Then there is the issue of commercial interests driving the agenda for alternatives. All substances other than the unpatented hydrocarbons, are in the hands of powerful companies, the same that have made billions from the sale of ozone-depleting CFC and its equally noxious substitutes. Developing countries are right in asking questions on issues of patents and technology payments before they make the transition. But the Montreal Protocol with its powerful leverage of trade—countries which do not agree and do not comply cannot sell products—is clearly the mechanism of choice. But this time, the choice has to be right. There are many trade-offs that need to be considered before technology options are finalised. For instance, it is clear that the gas itself is only one-tenth of the problem. In the life cycle of any refrigerator or air-conditioner direct emissions from refrigerants are small compared to indirect emissions from the use of energy to run the device. So, if a choice has to be made between gases with moderate GWP substance and energy efficiency, it may be better to opt for the latter. But this is not good enough. The transition has to be towards super- efficient air-conditioners and refrigerators, which use climate-friendly gases. This will be a one-time transition; we cannot allow the chemical treadmill to continue. 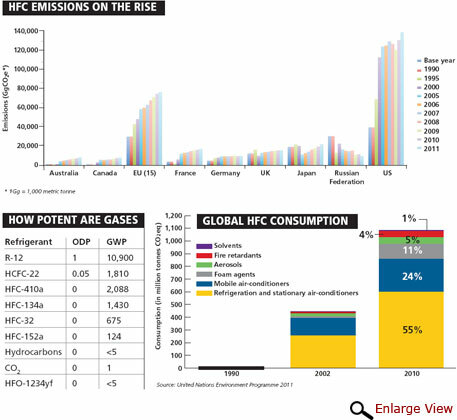 It is clear that HFC emissions are expected to double globally by 2020 and there is a choice for developing countries. They have not entirely shifted to HFC and can get the transition right in one go. This means the world can avoid emissions, not first release potent greenhouse gases and then find new, less harmful substitutes. It is also a fact that India’s refrigerant industry has accumulated obscene profits. It has taken funds first to phase out CFC under the Montreal Protocol and then funds to burn its byproduct under the climate convention. The Indian government should not succumb to this pressure and allow for double-triple transition, which makes windfall profits for its makers. The question it needs to ask is: how can a global mechanism incentivise a single leapfrog this time. The world lost the opportunity 20 years ago, when it knew that ozone substitutes had huge implications for climate change. But they went ahead and did not look at the then nascent but viable hydrocarbon option, simply because they were cheaper and had no patent masters. This must not be repeated. Industrialised countries need to fix their own backyard. The HFC phase-out schedule for the industrialised countries under the US and Micronesia proposal, or for that matter the proposed F-gas regulations of the EU, are just not sufficient. If developing countries are to leapfrog, then the rich world, already emitting HFCs, cannot keep using it for the next 20-25 years. Clearly, a much more strict phase-out schedule for the industrialised countries will have to be agreed to. Besides, the debate on HFCs should not take the focus away from steps that have to be urgently taken to reduce CO2 emissions. Meanwhile, the negotiation to phase out HFCs is going to be tough and challenging. After all, there are markets to be gained and lost and money to be made. But in all these, we must not forget the past mistakes and find answers that benefit people and the planet. Much is at stake for the world’s “most successful” environmental treaty. Unfortunately, efforts by Micronesia and Mauritius some 5 years ago at the level of the Montreal Protocol to phase down the use of HFC's have been vigorously opposed by the BRICS countries. otherwise we would have moved further in combatting Climate Change. And during the last five years we have seen how the signs of climate change have accelerated affecting the brics countries mostly. It might be too late when they react! An extremely detailed, comprehensive and useful summary and analysis of the issues in play, although the role that can and needs to be played by ammonia R717 and CO2 R744 in commercial and industrial refrigeration sectors is understated. Hydrocarbons also have a 20 year history of use in the automotive AC service market across many countries, notably the US, Canada and Australia (8% market penetration according to a recent Goverment commissioned report "Cold Hard Facts 2" which ought not continue to be studiously ignored by Montreal Protocol delegates and stakeholders. The lesson is clear: Given this real world evidence, there is simply no excuse for HCs to be excluded from consideration as a global solution to the HFC problem in new mobile AC and refrigeration systems. All that is lacking is a champion with the courage to confront the fear factor generated by the fluorolobby. What a wonderful and informative piece I've read after a long time. The profits section was the most shocking part to me. I loved the entire article thoroughly. A trade-off has to be definitely made by rich companies and affluent countries before they ask developing nations to shift to a climate friendly gas. "A highly energy-inefficient equipment using a least GWP refrigerant will have more life cycle emissions than a highly energy-efficient equipment using high GWP refrigerant." I didn't get this point.